I get 'loading' for a sec or two, then it shows the content. I have the user account set to only show a single VM with visible, read, and exec checked. 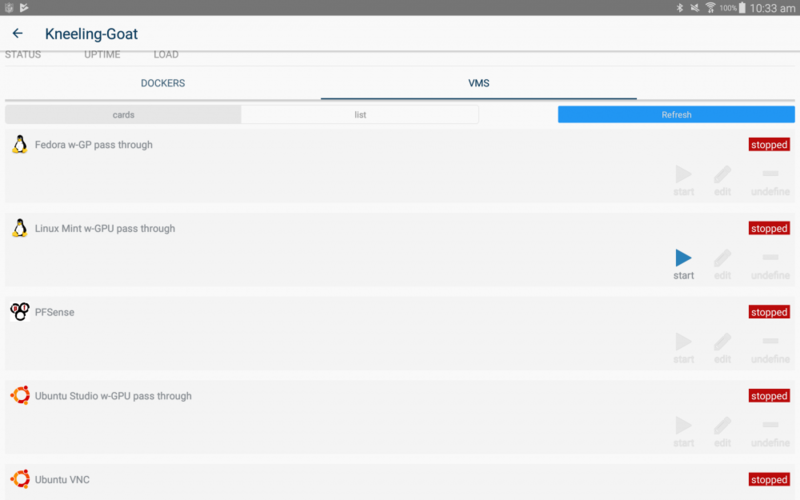 All other VMs or Docker containers are blank. When I log into the app on my tablet, however, all Docker containers are visible (though not selectable). 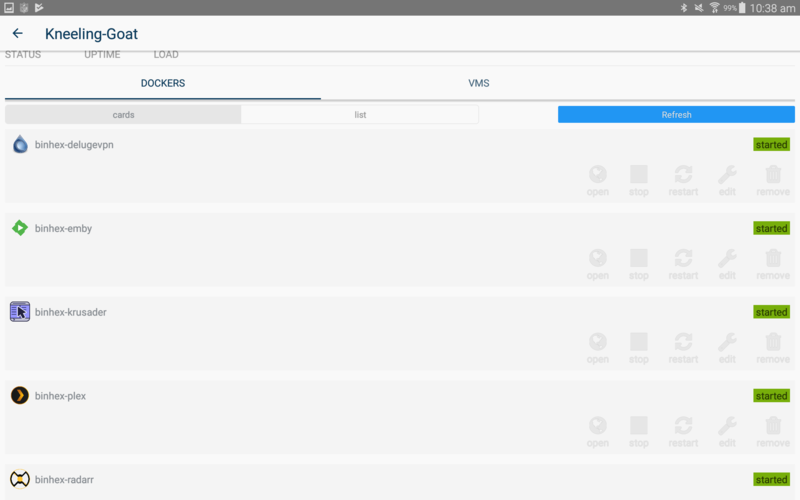 Also, all VMs are visible (though not selectable). 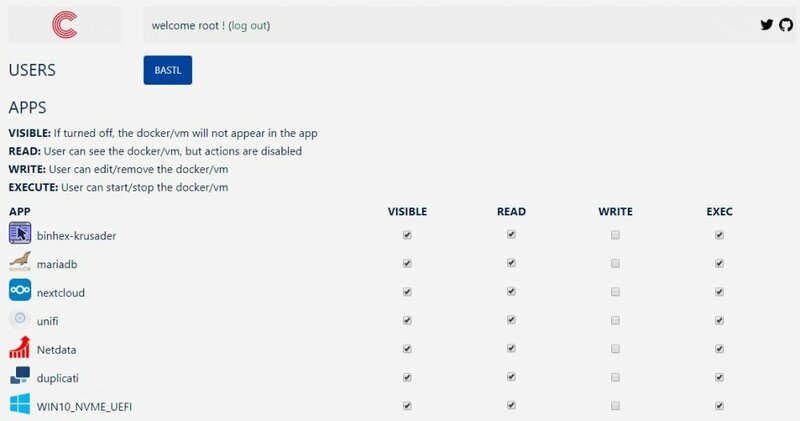 How do I prevent Docker containers or VMs even being visible when they have not been selected in the plugin UI? 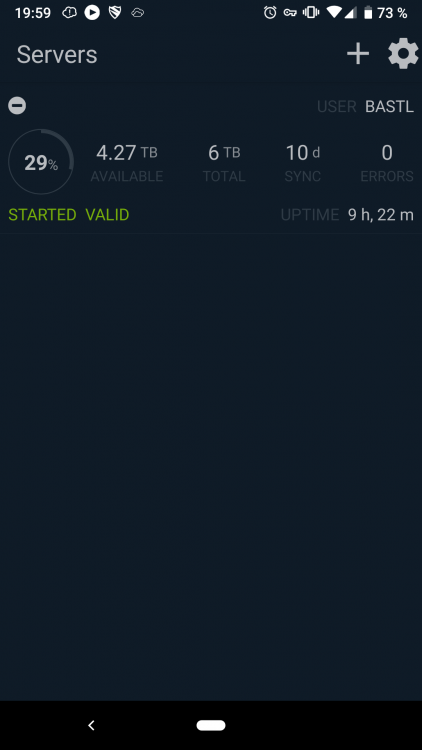 I dont need Dockers to be accessible via the app and also want to control which VMs are visible. If visible is unchecked, the docker/vm should not appear. So you're accessing the app with a user other than root and you can see everything. What do you mean by not selectable? That there is no action available ? Yes. I am logging in from the Android app using a user I created called "vmuser". I have to utilise the root password as the one for the actual "vmuser" does not find a server. By unselectable, I mean that the VM is listed with the start, edit, and undefine options greyed out. There is also some weirdness going on with checking the various boxes next to a VM in the plugin. If I check a box another previously checked box disappears and another one appears. It is like playing whack-a-mole. As an example I just removed all check marks. When I check "Visible" for a VM "Read" also is checked. When I then check "Exec" it stays checked for a few seconds then becomes unchecked. If I then go to another VM and check "Visible" it stays checked for a second or so then becomes unchecked. However, the "Exec" which I had previously checked, which went unchecked, now becomes checked. I am using Chrome v 71.0.3578.98. On the Android device, I would like to only have displayed a "Start" and "Stop" button for whatever VMs I want to be selected. I am intending to use your app as an interface to start whatever VM I want onto my monitors. So whilst I have a bunch of VMs I dont need to have shown on the app as starting them doesn't do anything because they don't have GPU pass-throughs. For example, when I am no longer using my desktop VM I want to shut it down and turn off the monitors. When I do want to use it again I can start whichever VM I want to utilise using the Android app. Which means only VMs with GPU passthroughs. The description changes every time I make alterations in the plugin as well. Thanks a lot for the info darrenyorston. With regards to apps showing as unselectable, it was a design decision I made when I implemented the feature. The idea was that you could 'taunt' the non-root users and tell them ... look! look at all the apps you're missing out on, since you're not root 😁 😁 😁 ! Joking aside, I can't remember why I decided to show the docker/vm as non selectable, even if marked as not visible. I've fixed this behavior in my dev environment. If Visible is not checked, the app won't appear. I'm waiting for 6.7.0 stable to release a new version (which should be 'any time now' (tm) 😁). As for the whack-a-mole, that's mostly for consistency. There's probably a couple automations I've missed, but it seems to work consistently for now. v2019-02-08 - 2.15.0 is out ! This should also fix the issue mentioned by darrenyorston ! 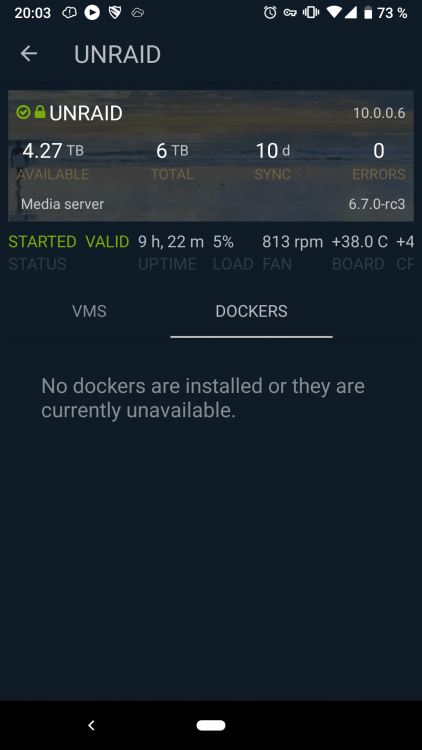 If I have a user setup in unraid and the same configured in the ControlR settings to be allowed to VIEW, READ and EXEC a specific VM or Docker that exact using should see that VM and or Docker in the android app, right? I am a bit confused right now. I had the user root conected before and all showed up. As soon as i use another user, none of the Docker or VMs are shown. Did i miss something? Can you double check that in the ControlR settings the Visible checkbox is checked for that user/dockers/vms ? Could you follow the steps at https://github.com/jbrodriguez/controlr-support ? I'd like to replicate the issue with your user data. @jbrodriguez I've send you a pm with the support logs. Thanks for the report Saken ! Regarding bastl issues, we identified a couple of issues with the plugin. I'm making some adjustments that should be ready soon, most likely will wait for 6.7.x stable to release a new plugin version. Finally got the opportunity to have a look at the update. 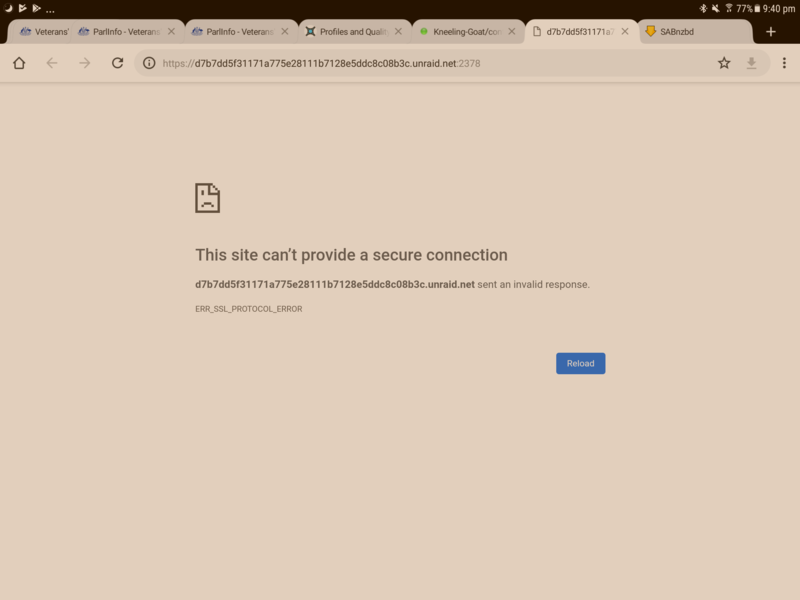 I am having an issue where the web UI isnt accessible with SSL active. Do I need to edit something in the plugin to allow it to work with SSL? This is to get an idea of what the plugin is doing, post back the command output. If you change port 2378 to 2379, can you confirm that it works ? There's some issue with the plugin php/js logic to detect whether the server is running ssl or no. I'm looking into it. Also, is your ssl set to yes or auto ? Didnt work. I tried a few other ports as well. Same result. SSL is set to yes. It should have worked. It was a different error though, right ? If I change the port to 2379 the server wont start. It shows stopped even though Enable Control Server is set to Yes. And yes I clicked Apply and Done. 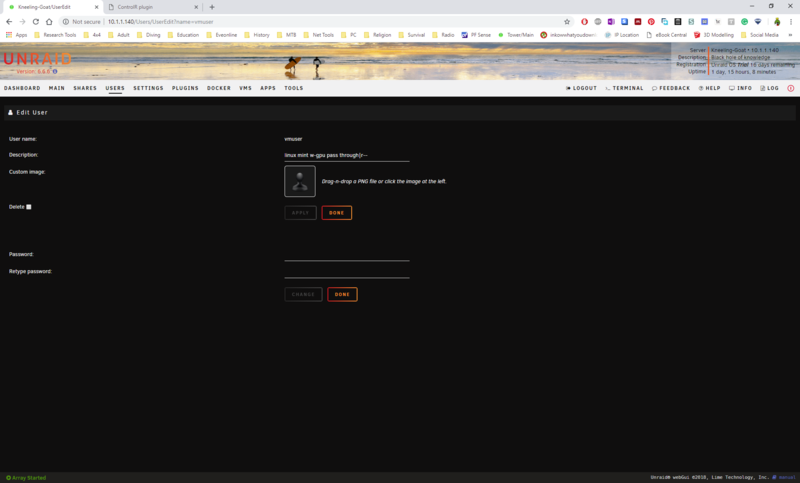 Ok, repeat the steps above, only this time change to port 2379 in the browser address bar/url, not in the plugin settings (I wasn't clear on that).